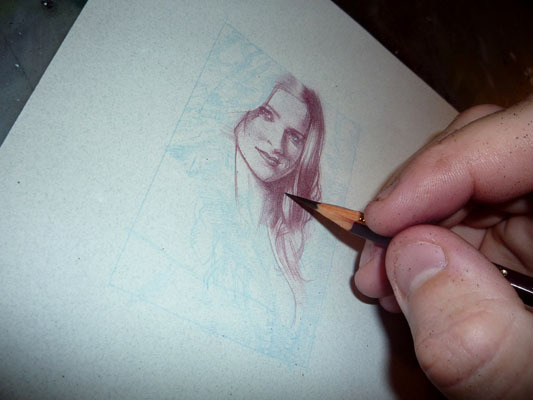 The new card I'm working on, another commission (trying to get the list worked down) Kahlan from 'The Legend Of The Seeker'. I like that show a lot and I've been hoping someone would ask for her. Thanks for the comment yesterday Jim, you where one of the guys that got in super early and stuck with me, I appreciate it immensely. I think the Stevie Ray Vaughan piece was only my fourth or fifth commission. Honestly, I really don't know why people are sending me stuff about this, most of the time I'm on the receiving end of arguments like these. I don't know how many times I've been called a bootlegger, or accused of flooding the market with my so called 'counterfeit' cards. So now I'm suppose to jump on the band wagon and attack another artist ... I don't think so. All this internet infighting and bickering reminds me of that Kissinger quote, without looking it up it goes something like "Academic politics are so bitter precisely because the stakes are so low."